Shall We Call November 5 As The International Day of #HMBalmanation? Every time a luxury fashion house releases a collaborative collection with a retailer for larger masses, a real fuss kicks up in the fashion world. Given that the recent collaboration of French fashion house Balmain under the patronage of the talented designer Olivier Rousteing with the Swedish gigantic fast-fashion retail-clothing company H&M has been an object of ardent discussions for already two months, we could have supposed from the very beginning that #HMBalmanation might register huge sales. But what was happening yesterday on November 5 at 250 H&M stores all over the world and online would be inappropriate to define as simply huge sales. When the #HMBalmanation lookbook was released with its slim-fitting glitzy pieces we instantly got fascinated; when the price tags were revealed we just started to save money but when the Balmain x H&M fashion show was finally presented with Rousteing’s favorite first class models, among them being Kendall Jenner, Gigi Hadid and Jourdan Dunn and when the designer declared the launch date of the collection being on November 5, we finally realized that the important day was approaching. Yesterday #HMBalmanation made an international boom, bringing the Balmain fans at the H&M stores worldwide to a frenzy. 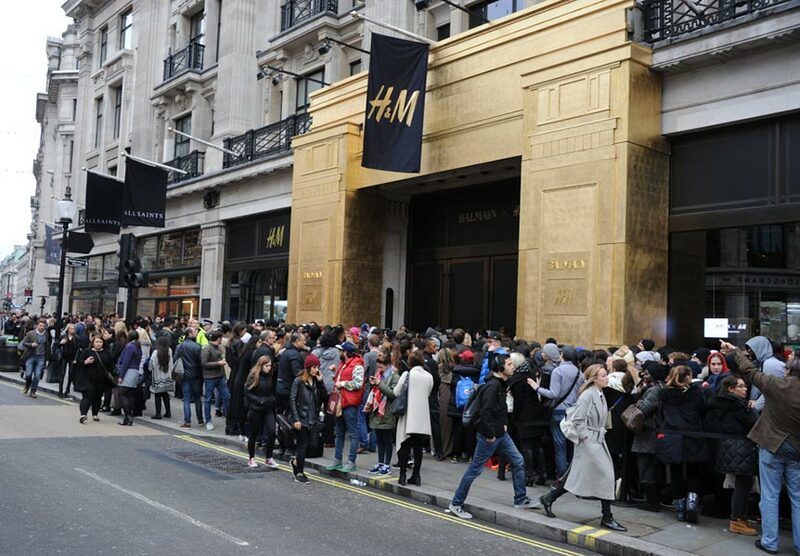 Thousands of customers had queued overnight in front of H&M stores in order not to miss that exclusive chance to enrich their wardrobes with one of those precious pieces of the 109-item limited-edition line. A group of people flooding into the stores were having in mind the green velvet dress on Jourdan Dunn, another group yearning to get hands on that hand-beaded embroidered velvet mini dress, while a generous number of #HMBalmanation anticipators were pursuing the Balmain x H&M branded T-shirts. In Manchester many fashion-conscious people had camped outside the stores overnight, while in the USA people had lined up a day or two days before the launch. So much was the rabble outside the H&M’s flagship Regent Street store in London that the police were called to discipline the jumble. But the Korean fans really set the record in holding the line, having been queued since last Thursday. H&M’s website crashed at around 8 AM, and when it was back at 9 AM, the entire collection instantly sold out! While some fashion-lovers were aspiring to jazz up their appearance with #HMBalmanation precious pieces, a group of people were pursuing some speculation goals. Later on the same sought-after pieces appeared on eBay at prices doubly expensive than their actual prices were ” the black, white and gold beaded dress listed for $1,600, the beaded velvet dress ” for $1,400, while the beaded blazer ” for $1,200. Given that there had been placed an in-store restriction of two items per style per customer (each customer also had no more than 10 minutes to shop no more than 5 items from the collection when entering the store) and an online restriction of one item per style per customer it was quite natural that eBay #HMBalmanation had also registered unprecedented sales. 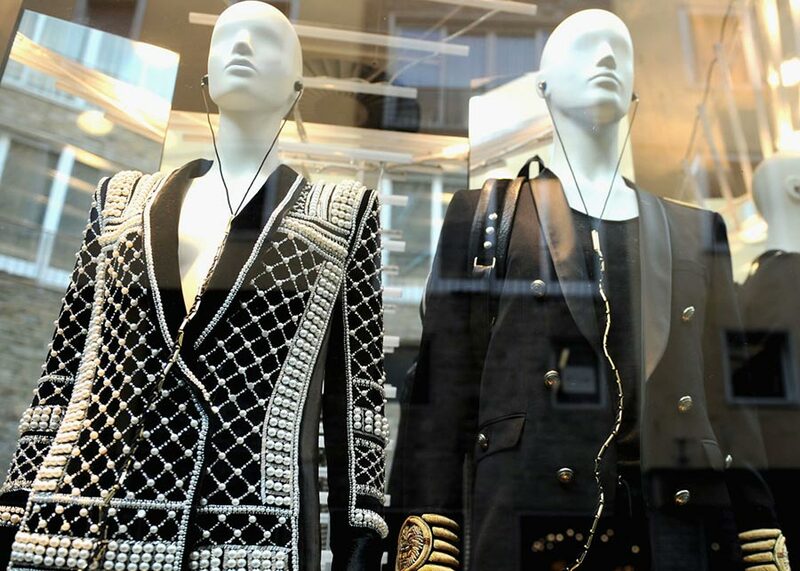 No wonder, the Balmain for H&M collection has been the most successful collaboration the Swedish retailer has had so far with luxury fashion houses. We just wonder who’s next on the list?